The good news is that the recently announced Lumia 640 and Lumia 640XL will both have SensorCore built into them as well. If you do not have one of these devices then you do not have the technology built into you device which mean you will have to go down the Fitbit, UP! 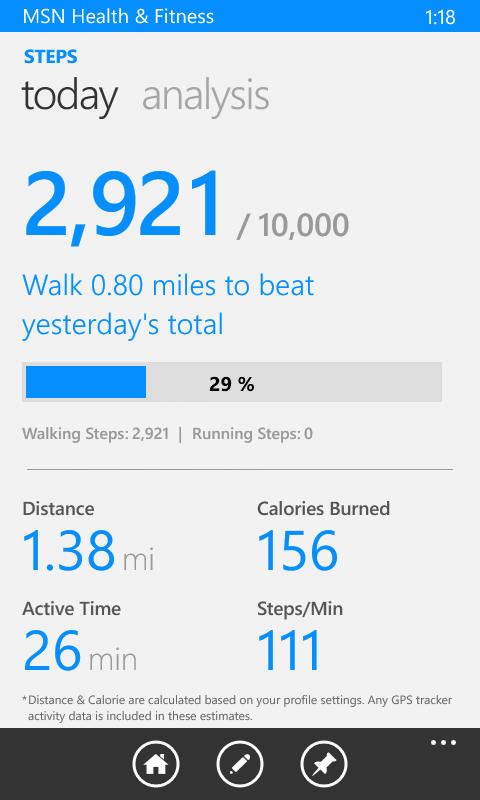 or Microsoft Band route to track your activity. Right now you can get a Lumia 830 with a free Fitbit Flex from AT&T for $99.99. If you don’t want to wear a tracker, you could go get yourself a Lumia 635 at the Microsoft Store for $49 without a contract on AT&T. That’s $50 less than the 830 package but isn’t nearly as good a phone. But it is less expensive, by a lot, and a pretty darn good phone in my opinion. You can read my review of the Lumia 635 at this link. Assuming you have a SensorCore enabled Lumia, you will need to enable it on your device. Go to Settings>Motion Data then turn the service on. It is off by default because it does consume additional battery power on your Lumia. If you are going to use a Fitbit for example, you should keep this turned off. It doesn’t drain the battery heavily but it does consume power. 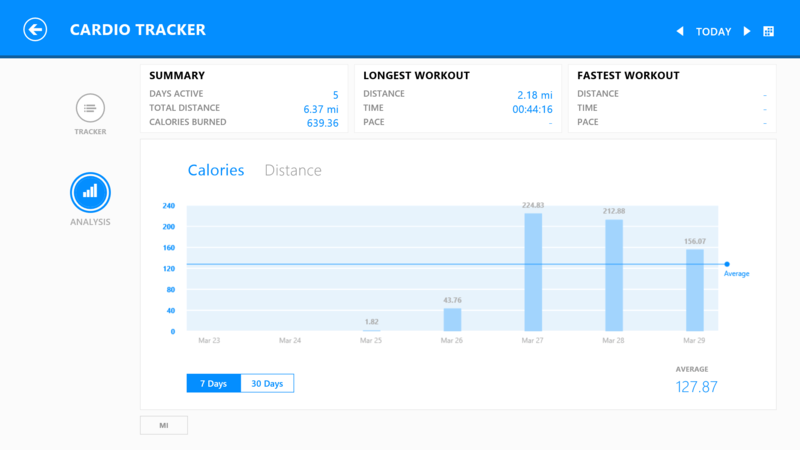 With Motion Data now enabled, you will start tracking your activities right from your Lumia in your pocket. Now it is matter of getting an app that will interpret the SensorCore data and that is where MSN Health & Fitness comes in the picture. MSN Health & Fitness is a free app in the Windows Phone store that is actually one of the better MSN apps in my opinion. It gives you news and information on health trends but also gives you recommendations for workouts and even provides a symptoms checker if you are not feeling tip-top. 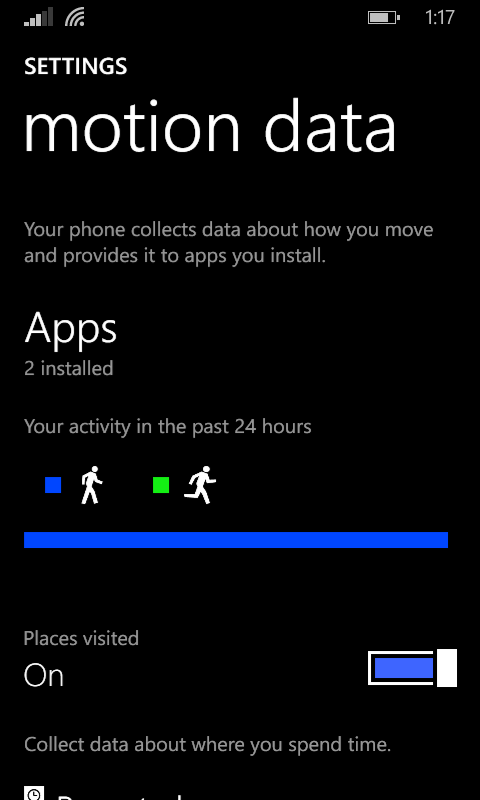 Even if you don’t have a SensorCore enabled Lumia, download this app and give it a try. One other added benefit: If you use MSN Health & Fitness on your Windows Phone and your Windows PC, your data will be synchronized across the both so you can see your activity in both places. It is recommend that we should take 10,000 steps per day to maintain a healthy lifestyle. For most people this breaks down to 4-5 miles of walking. If you are just starting out with a exercise routine, this will seem like a huge number but actually it’s not. By carrying your Lumia in your pocket as you walk around your place of work or just your normal day-to-day routine, you will find that most people walk 2-3 miles anyway. That means most of us don’t really have to do that much more to get to 10,000 steps. make sure I get a good amount of exercise in to push through the rest of the week. Within the MSN Health & Fitness app you can also track your diet to give you a good idea of how much you are eating on a daily basis. Most people, especially Americans, overeat by a lot each day which is one of the reasons why we as a nation struggle with our collective weight. I’m not suggesting that this app is as sophisticated or provides you the level of diet detail that MyFitnessPal does (which is also a free app) but it is a starting point for you if you are not sure where to start. I suggest keeping one thing in mind about using a SensorCore enabled Lumia to assure you get as accurate a step count as possible. You have to have the phone on you at all times, just like you would a wearable tracker like a Fitbit. In the testing and using this on my Lumia 635 for this post, that device is actually quite comfortable in a pocket but your mileage will vary. I know Tricia has raised many times on Twitter – as has my wife – that women’s pants are not well suited to carrying a phone in a pocket. If that is the case or you don’t want to carry it on in your pocket, a jacket pocket works or even carrying it in your hand. The SensorCore technology does a really good job of figuring out if you are just swinging your hands around or actually walking making it hard to get false positives on your steps. No tracker is perfect and this isn’t either but it is pretty darn good. The most accurate measurements I found in my testing though were in your hip pocket or front pocket on your jeans, pants or shorts. If you are looking for an easy way to get started tracking your steps, you can do it with your SensorCore enabled Lumia and the MSN Health & Fitness app. It is quick and easy and it could be the first steps you take to a healthier, more active lifestyle. Nice article, I love msn h&f too but I’ve a huge problem with steps data. Every day it resets so I have only the today data and never the numbers from the days before. Do you know if this is something like a known issue of the App or I’ve missed something in the configuration? I will have to look in the app again but I believe there is an archive or history function.